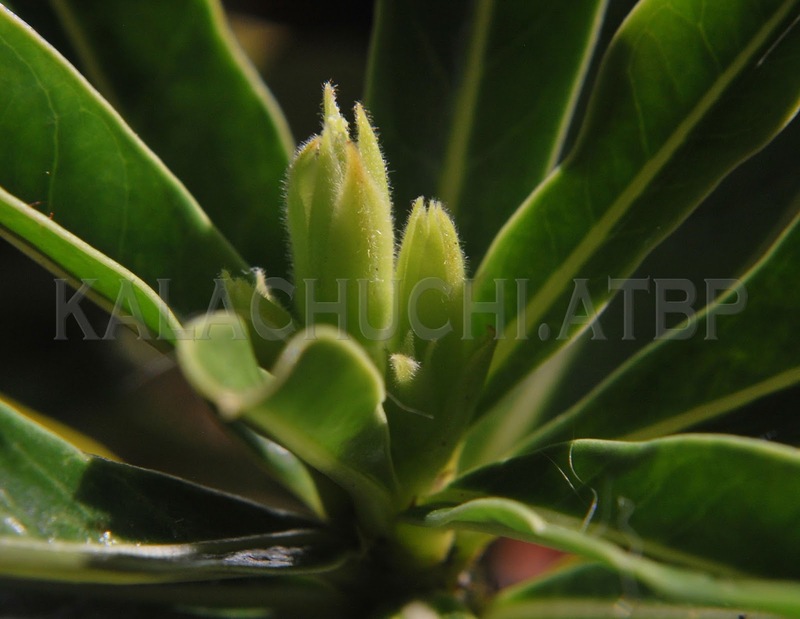 It is said that adeniums grown from seed will develop that signature fat trunk while rooted cuttings will not. This is kind of true, in that a rooted cutting will not have the tapered fat trunk per se. 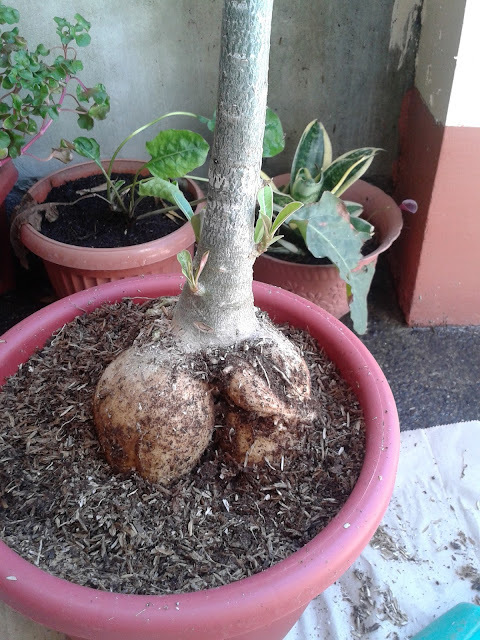 But it will still develop fat roots. 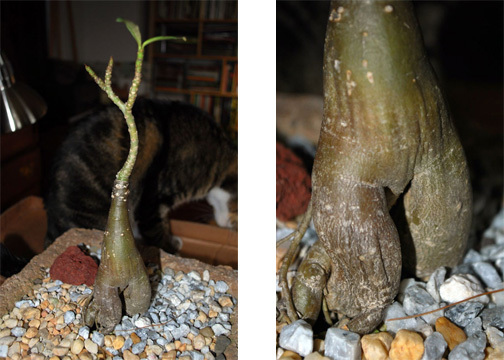 The overall look is a bit more abrupt and slightly more obscene but you will still get that unique adenium look if you allow the roots to develop for a while---one to two years, say, before lifting it. The longer it is left under the soil, the bigger it will get. 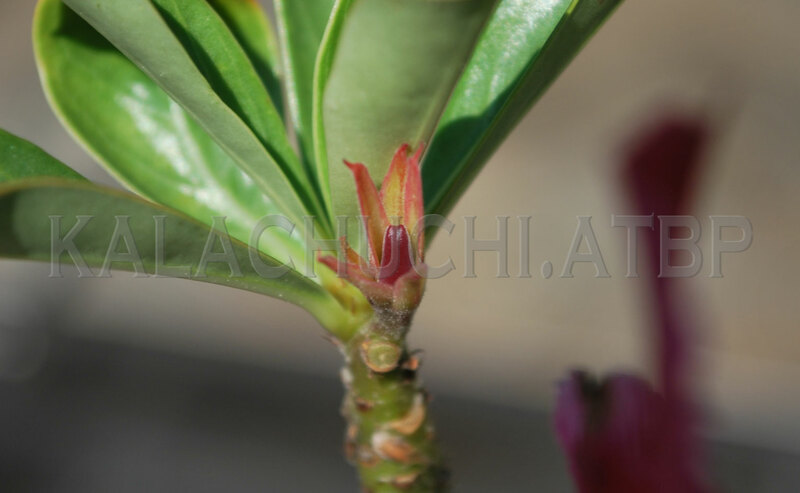 Growers who like to manipulate adeniums and bend them into various shapes often do it the bonsai way--gentle and slow bending with the use of soft wires over a period of months or even years. 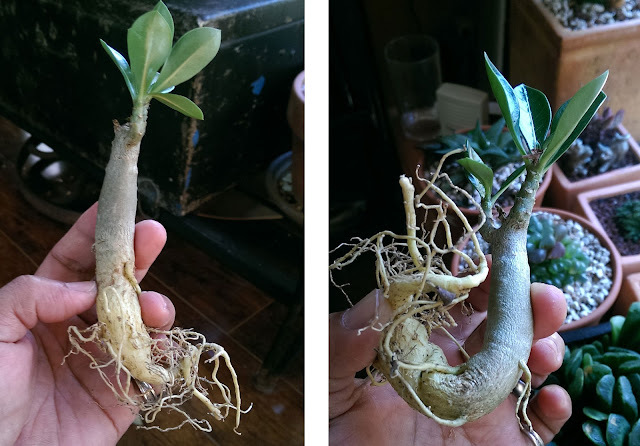 It takes at least a month for small adeniums to be this bendy, longer if it is bigger and older. This seedling was in the ground the whole summer and was dug out to see what sort of growth it accomplished. A runt to start with, it didn't do much. I was going to throw it away but instead it got left somewhere under a table before being rediscovered. After two months out of the soil, it is still alive and very flexible. It gives you an idea of how these plants can be bent into various curves and whatnot. 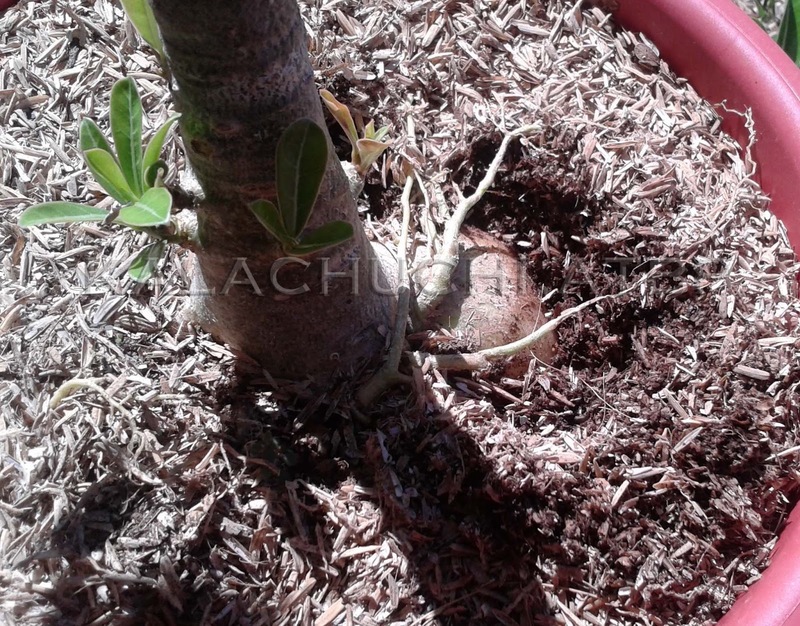 In this condition, it can be held in shape with a yarn or a strip of cloth in order to not mar the surface or bite into the trunk as it grows and expands. 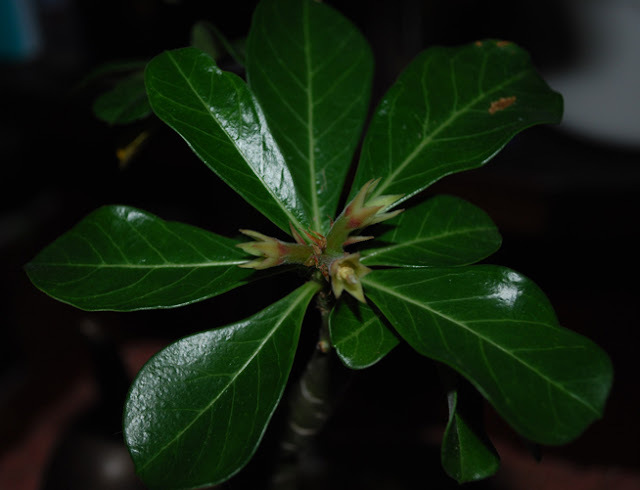 This plant was originally being hardened for winter and had not been watered for a month. 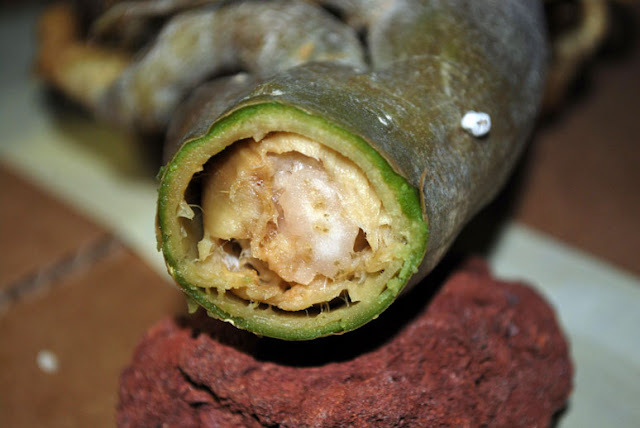 Note that there is no rot, just cellular breakdown as water crystals broke through the cell walls and turned the whole caudex into mush. This is what it looks like when pollination was successful, in this case, by some random bug or bird. This is a fairly common worry among growers. 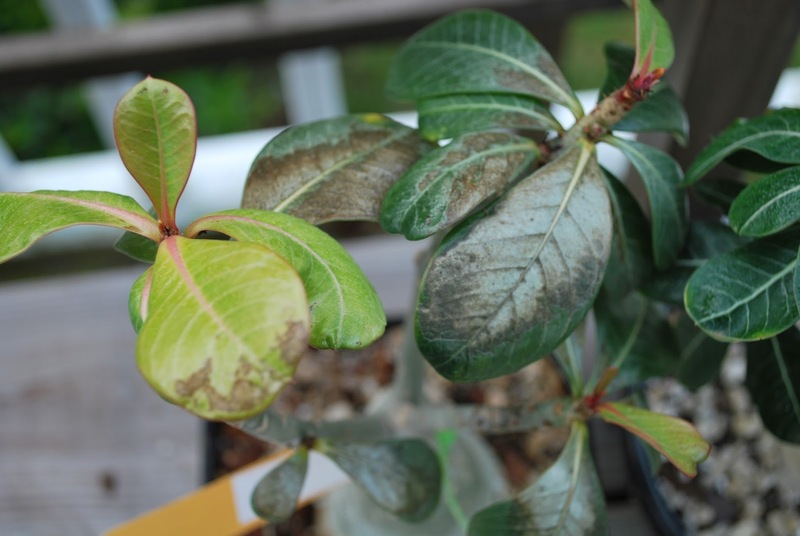 There really are no variations to what sunburned adenium leaves look like. If it doesn't look like this one below, your problem is something else.